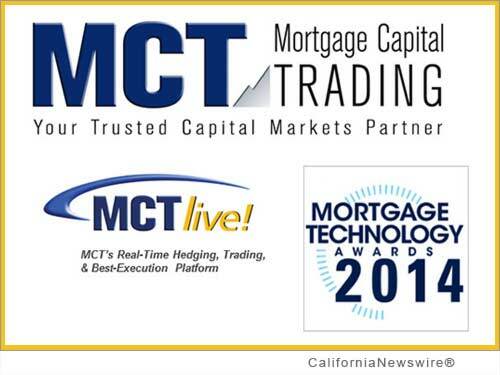 SAN DIEGO, Calif. /California Newswire/ — MCT Trading, Inc., a recognized leader in mortgage pipeline hedging, loan sale execution and risk management services, today announced that it has been chosen by Mortgage Technology magazine as a finalist for the 2014 "Release of the Year" Award. SAN DIEGO, Calif., Sept. 30, 2014 (SEND2PRESS NEWSWIRE) — MCT Trading, Inc. (MCT), a recognized leader in mortgage pipeline hedging, loan sale execution and risk management services, announced that it has been chosen by Mortgage Technology magazine as a finalist for the 2014 Release of the Year Award. MCT was named a finalist for the development of MCTlive(TM), an advanced secondary marketing technology platform designed for capital markets trading and pipeline management. MCTlive provides lenders with a completely browser-based software solution, robust online tools, and real-time analytics for secondary marketing departments. According to the magazine, the Release of the Year Award recognizes a new software, platform, alliance or initiative that's expected to have the broadest future impact on the mortgage industry. "Being recognized by Mortgage Technology magazine as a finalist for its coveted Release of the Year Award is a huge honor," commented Curtis Richins, president of MCT Trading. "Unlike most secondary software solutions, MCTlive was actually built by and is supported by people that are loaded with secondary marketing experience. Our approach is different than anything else offered in the industry." MCT says the combination of its hands-on advisory services approach that accompanies dedicated trading analysts coupled with MCTlive's comprehensive hedging, trading and best execution technology is a major competitive differentiator. The winner will be announced at the Mortgage Technology Awards ceremony hosted by SourceMedia at the 101st Annual Mortgage Bankers Association Exposition and Conference in Las Vegas, Nevada on October 19, 2014. MCT Trading is a risk management and advisory services company providing independent analysis, training, hedging strategy and loan sale execution support to clients engaged in the secondary mortgage market. Founded in San Diego, California in May 2001, the company has expanded to include field sales and support offices in Philadelphia, Dallas, San Francisco and Charlotte. MCT is recognized as a leading provider of mortgage pipeline hedging service and currently supports more than 100 clients on the HALO (Hedging And Loan sales Optimization) Program. MCT also offers a central lock desk service to mortgage bankers that effectively outsources the lock desk function called LockCentral.